This sunny, private villa is situated in a quiet, mature, residential area in the heart of Malaga province. Boasting its own unshared private, secluded pool, sun terraces and gardens, the villa is ideal for a family summer holiday and equally ideal for a romantic get-away. It has a large balcony giving panoramic views of the mountains and sea and is just a 10 minutes walk to the beach. With views of the sea from the balcony you can have a romantic meal on the terrace while the family can sit and relax around the sunny, secluded, private pool area. Being just a stroll away from the local railway station, it is ideally positioned to explore both the Costa and 'real' Spain. Location: Located just 25 minutes from Malaga Airport, the villa is situated in a quiet, mature complex that stretches from the beach back into the hills. The views from the villa are magnificent. In one direction you can look up into the hills and the while-walled village of Benalmadena Pueblo. In the other, the blue seas of the Mediterranean stretch out in front of you. With just a 5 minute walk to the local railway station and a 10 minute walk down the the beach, it is difficult to imagine anywhere more ideally positioned. The Villa: The large terraces and the private swimming pool are the first things that greet our guests. Open the front door and you look into the spacious lounge with marble floors and high ceilings complete with huge picture window and large balcony looking down to the sea. The main room is equipped with air-conditioning which also provides heat in the winter. Downstairs are the two double bedrooms each equipped with air-conditioning, ceiling fan and external blinds which keep them cool for those hot summer evenings. With gardens walled to give total privacy, visitors can relax in tranquil surroundings while access to the local tennis club with floodlit courts, large swimming pool and world class golf courses are only minutes away. The Urbanisation: At the entrance to the urbanisation there are several beach bars and restaurants. There is a mini-market, a cafe, a bar as well as real-estate offices in front of the newly opened International English School. Just through the under pass are beaches, more bars and restaurants as well as the local hotel which has entertainment most evenings. Further back in the complex is the local railway station servicing the coast from Malaga via the airport through to Fuengirola - it is even possible to take a series of trains all the way from London to the urbanisation - one of our clients did! Besides the station there is a small road that travels up into the hills to the village of Benalmadena Pueblo which offers stupendous views over the coastal plain as well as a small restaurant on nearly every corner. I fell in love with this villa the very first time I travelled to mainland Spain back in the early 80s and have been living there off and on ever since. The main selling points to me were the wonderful views of the sea and mountains, the tranquil setting and the proximity to the station making the villa secluded enough from the hustle and bustle of the local tourist spots yet near enough to take advantage of them whenever I wish. Had a great 5 days away at the villa! 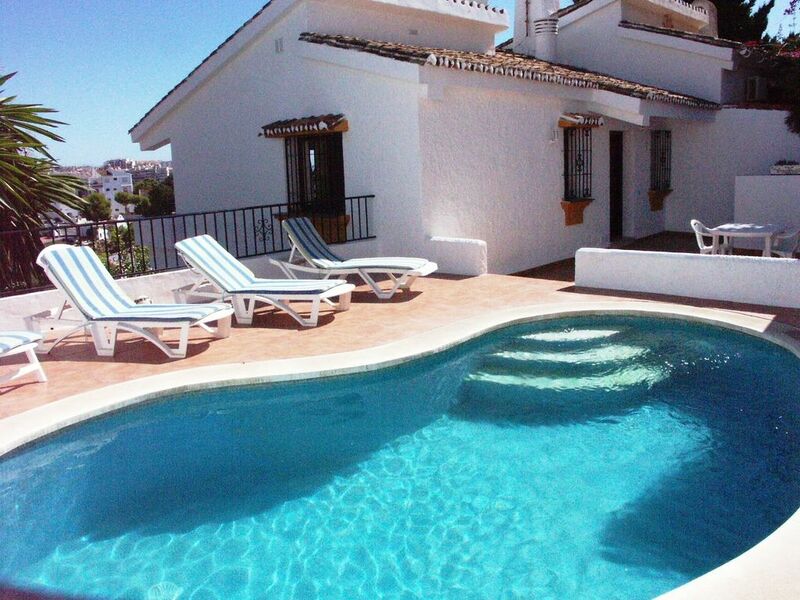 The villa has everything you could want or need, stunning views, great pool and 5 mins to the train station. Will definitely recommend to all my friends!! Just back from an amazing week staying here over New Years. The villa is beautiful and in a great location, train station is just a few minutes walk away with easy links to Fuengirola,Torremolinos, Malaga and Malaga airport. Just returned home from this amazing little gem. What a fantastic place and a brilliant host whos attention to detail is second to none. Public transport links are fab with a 5 min walk to torremuelle train station and 10 min walk to the bus stops. The villa has everything you need plus much more besides and the views are to die for!! We cant wait to go back next year. Torremuelle is a quiet residential area situated on the coast midway between Torremolinos and Fuengirola. It is just 20 minutes from Malaga Airport. Torremuelle has its own railway station on the line from Malaga via the airport to Fuengirola. In fact the proximity of the railway station and the local bus services has meant that the majority of our clients do not hire a car. Within the area there is a small supermarket, several cafes, bars and restuarants. Golf: With an excellent 18-hole course at Torrequebrada (tel: +34 95 2442742) only 5 minutes away, and a choice of 30 other courses within one hour's drive you are ideally situated to make the most of your golfing holiday. The year round sun and easy day trips to such famous places as Granada, Gibraltar, Seville, Ronda and Cordoba make this area perfect for your holiday, golfing or not. Rates for long term winter lets (4 weeks or more) available on request. Change over day is Saturday.